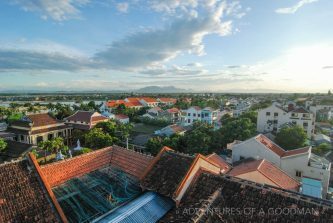 After a grueling overnight bus ride on the Open Ticket, we arrived at Hoi An at the crack of dawn in front of a three star hotel. A brief hotel search revealed that we weren’t going to get anything cheaper without walking a lot, so we decided to treat ourselves to a $12 room that had AC, a TV, two huge beds, free wifi and Internet, a fridge, balcony and use of the giant pool. The only catch was it was only open for one night, so after a nap we spent four hours wandering the city searching out something better. I can’t even count how many hotel owners looked us up and down before deciding that they were full or before quoting a price that was far more than the one printed on their wall. Racism at its finest. Hoi An is most famous for its tailor shops that can replicate any piece of clothing (designer or not) and fit it to your body for dirt cheap prices. Our second day in town started by spending three hours looking through thick catalogs of all sorts of clothes before settling on a three piece suit and shirt for me and a dress for Carrie that would be ready later that day. At the first fitting, however, the clothes were so tight and wrongly tailored that Carrie could not get her dress down all the way and my suit pants looked like I was wearing spandex. Without taking any measurements, the woman ensured us that she has been a tailor for 30 years and knew how to fix the clothes. Shocker, it took two more visits and another whole day to actually get it to where we could say, “ok, close enough.” Meanwhile, we had another tailor making us winter jackets. Mine came out perfectly, but Carrie had a bit more trouble; she eventually had to ride on the back of a moto to meet the tailor for a personal fitting to ensure no more alterations were needed. While not looking for hotels or trying on clothes, we spent hours bike riding the streets and visiting a series of beautiful old houses, temples, pagodas and bridges as well as taking in a brief performance of local dance and music. Another day we boarded a tour bus for a day trip to the My Son ruins. Though they paled in comparison to Angkor, they were still pretty well conserved…especially considering the US Army bombed the area heavily during the Vietnam War. The tour also included a boat ride back that offered the chance to see dozens of local fishermen at work, ferries shuttling people around and the small circle boats that Vietnam is famous for. And, of course, no tour would be complete without 30 minutes to walk around a carpentry village to buy some handicrafts. It’s like, can’t I just have the tour without that stop?